My favorite thread company is Superior Threads. They carry a wide variety of thread contents, colors and spool sizes. Occasionally they have a sale and that’s when I like to purchase for my “collection”. Recently they had a sale on their “Try Me Specials”. These are thread options that you select the thread content, but have no selection of the color. Because the price was so good, I decided to purchase some spools of thread that I had been wanting to try. I also purchased several spools of Masterpiece thread. This is my favorite thread to use for piecing and quilting. It is a 50wt thread and does not add much bulk to seams or on the surface of the quilt. I thought that if I received a color I already had in my collection, that would be fine because I knew I would be using it. But, if I received a new color, that would add to more options for quilting. I order five spools each of Masterpiece, King Tut, Bottom Line and Metallics. When they arrived the colors were beautiful. 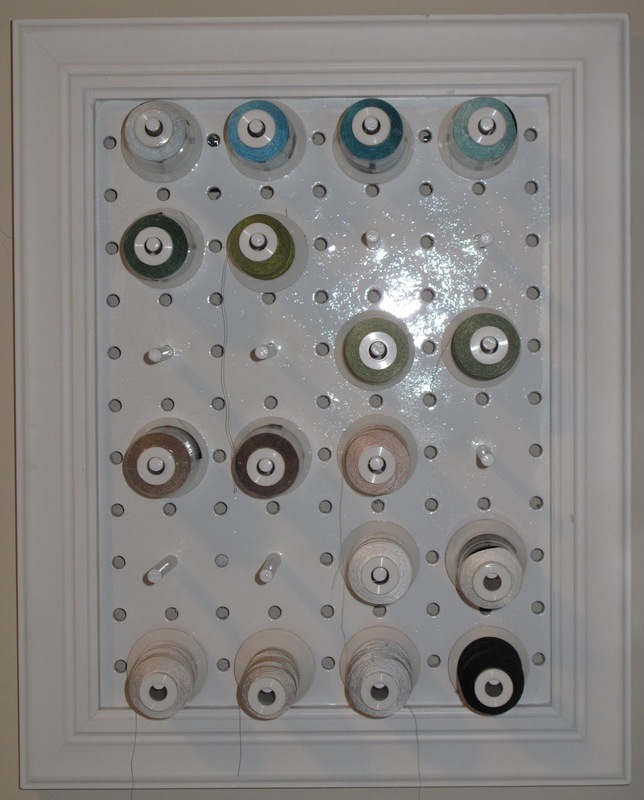 But, when I brought them up to my sewing room, I realized that my thread racks were full. So, I needed to figure out a way to store them. I thought about making a pegboard thread rack (like I have done before), but wanted more flexibility in the location for mounting them. So, I looked around at Home Depot for other options that I could try. 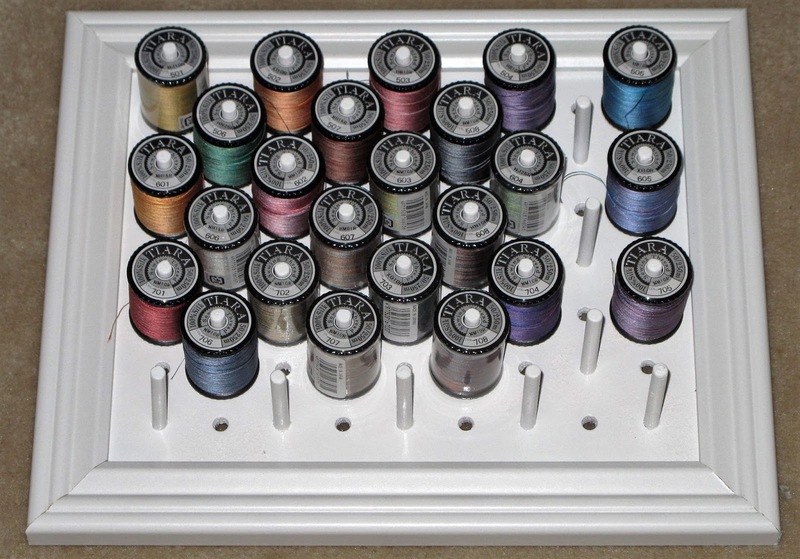 I really like these because I can mount them in any configuration and more easily sort my thread options rather than having them all on one large rack. 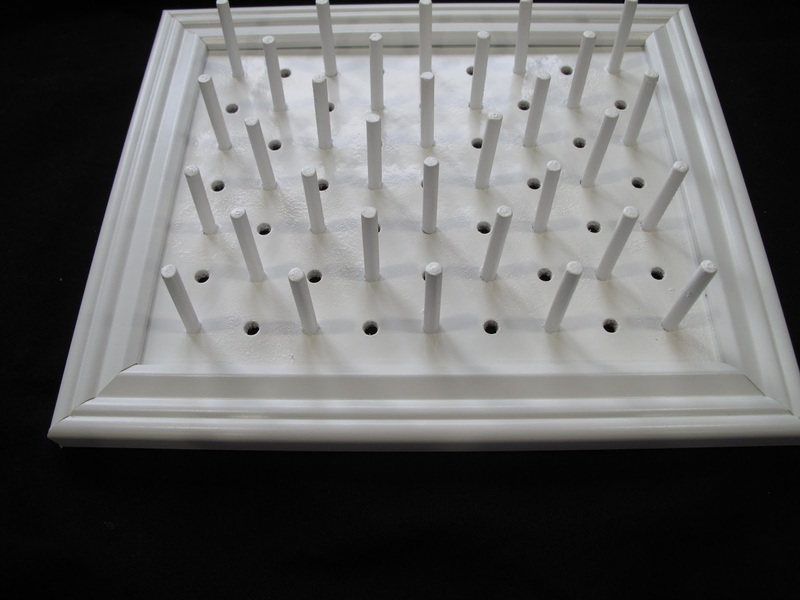 3/4″ x 1 1/2″ x 8 ft White PVC Trim. Purchased at Home Depot for about $6. Unfortunately I could not buy this in a short piece, so I have some left over for other projects, or more thread racks. 1/4″ x 12″ Plexiglass Rods, opaque white. Purchased from Amazon for $10. E6000 Industrial Strength Adhesive – already had available. Can be purchased at Hobby Lobby. Use a 40% off coupon and its only $3. Total spent was $16 for four thread racks. 1. Cut PVC trim to length desired. I used 12″ to fit the space I would be mounting them. The trim cuts really easily with a circular saw. 2. Cut the rods to 2″ pieces. The easiest way to cut the rods is to score them with a hand saw and then snap the pieces apart. Use fine sand paper to smooth the edges of one end of each rod. 3. Mark the locations for the rods, making sure that they are space far enough apart to fit the thread spools. My spools are spaced 2″ apart. Using a 1/4″ drill bit, drill holes about to about half the depth of the trim board. 4. Fill each hole part way with E6000 adhesive. Place one plexiglass rod piece into each hole. They will be snug and may require a small tap with a hammer to fully seat them. 6. Allow to dry. I mounted mine to the wall with velcro strips. I now have space for 48 more spools of thread. Lately, I have been doing a lot of hand stitching – applique, embroidery and quilt binding. When hand stitching, I like to have a place to rest my your feet higher than the floor in order to make myself more comfortable. Unfortunately this was something that I did not have in my new craft room. Wanting to add one, I starting looking around the room to see where I could store the footrest when it was not being used. The size of a place to stash the footrest would be the limiting factor for the size of the footrest itself. With the room maximized for storage, I was not finding a good spot to keep one. So, I put off purchasing one. This past week I have been working on binding a quilt. As a temporary measure, I pulled out one of my storage boxes from under my long arm table and used that to prop my feet on. It worked out fairly well, just the right size, but a bit too low. So, to get the height right, I put a folded flannel quilt on top of it. Unfortunately the quilt I used was a favorite of my cat, Onyx. Most times, when I went into my room to sew, she was sleeping on the quilt. So, I needed to figure out a more permanent option. A trip to Hobby Lobby to purchase a few items (2″foam, 5/8 yd print canvas fabric and elastic braid) and I was ready to make a slip cover to place on the storage box. First, I cut the foam to fit on top of the box lid (10.5″ x 14″). 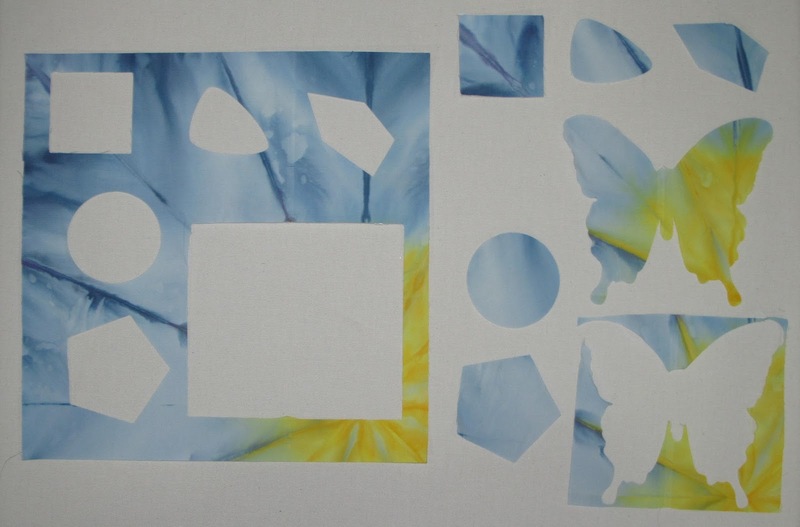 Then, I cut the fabric to 20.5″ x 24″. A few box seams in the corners, a hem with the elastic into and I was done. Now I have a colorful and comfortable foot rest. When not in use it fits nicely into the original storage spot without taking up any space in my room. I even had enough leftover fabric to make a nice throw pillow for my sofa. With three of our four boys living out of town, we have several unused bedrooms in our house. Earlier this spring, I decided that these unused rooms could be put to better use. Until recently, my long arm sewing machine was in the smallest of these bedrooms (11′ x 11″), a tight fit for a 10 foot table. My domestic sewing machine was in our laundry room. And, my craft supplies were in various closets throughout the house. One of the unused bedrooms is a fairly nice sized room. At 12′ x 15′, it is almost 50% more space than the small room that I was using. So, I decided to move my crafts into this larger room. Sorry boys, but the guest room is now in a bit smaller! After spending a few months planning out the change, I have recently settled in to my new craft room. I love my new space, and so does my cat Onyx. I now have all my crafts (except fused glass) are all in the same room. This means that I can work on multiple projects at the same time. 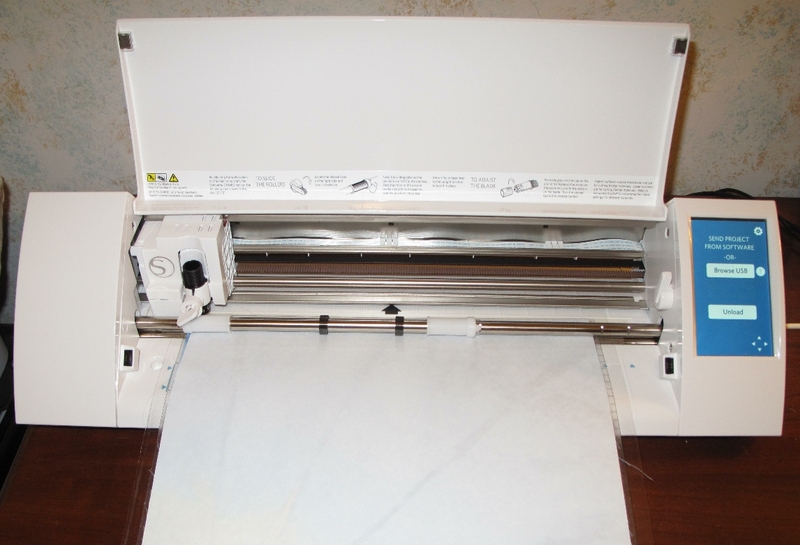 I can set my long arm sewing machine to stitch out a computer guided pattern, while cutting a paper craft project on my Cameo cutter and piecing another quilt on my domestic sewing machine. When moving in to the room, I sorted and organized all of my supplies, and even found some things I forgot that I had. I may not complete more projects, but I will certainly enjoy working in this room, especially with the large corner window. Since I now had a dedicated craft room, I also wanted to add a design wall. Originally I thought that I could make something that utilized the quilt hanging rod. After purchasing fabric (Kaufman Framework Flannel Gridwork), I added a lining and rolled it onto the rod. Unfortunately the flannel kept wanting to unroll and not stay neat and tidy. To try to solve this problem, I added Roman Shade cords to the back of the flannel. But, when pulled up, the fabric would also slide together on the rod and again not stay neat and tidy. So, I ultimately attached the flannel to some wooden boards and made true Roman Shades to use for the design wall. These boards were mounted at the edge of the ceiling and drop down when needed. I could only mount one section on the main wall of the room because I did not want to block the air intake which was located on one end if that same wall. To give me more design space, I mounted the second section above the closet. This is not ideal because large projects will be split into two separated spaces when working with the design wall. However, it does put design space very near my sewing desk. This will be handy when I am in the middle of a project. I will just have to get used to having large projects split into two sections. But, since I really didn’t have a design wall before, this arrangement is certainly better than nothing. For my long-arm machine, I normally use 50 wt cotton thread (Masterpiece from Superior Threads). I purchase these in cones that hold 2500 yards and are stored on wooden coat racks mounted to the wall in my sewing room. Occasionally, I like to use other thread – 100 wt silk for fine stitching (Kimono Silk) or variegated silk (Tiara Silk) for adding variation to the stitching. My supply of these mini-cones and spools was getting too large to just have on the shelf – I was getting annoyed by them looking messy. So, I needed a better way to store them, but I also wanted to easily be able to see my supply. With space limited, I opted to make my own thread racks that would fit on the wall. Total spent was $26 for three thread racks! 1. 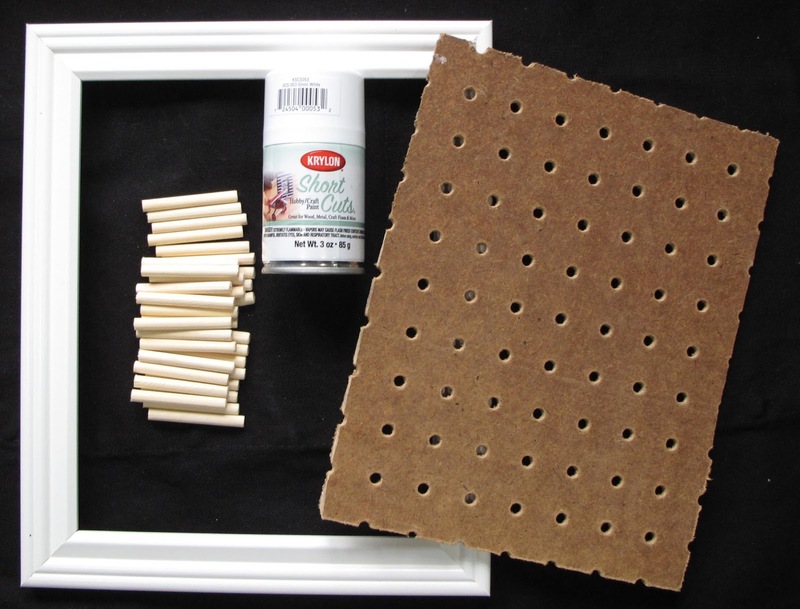 Cut pegboard to size that fits in the frame. Cut dowels in 2″ segments. 2. Determine the spacing for the size of the thread spools/cones. I made two racks with the dowels in every other hole to fit Kimono mini-cones. I made one rack with the dowels in alternating holes for smaller Tiara spools. 3. 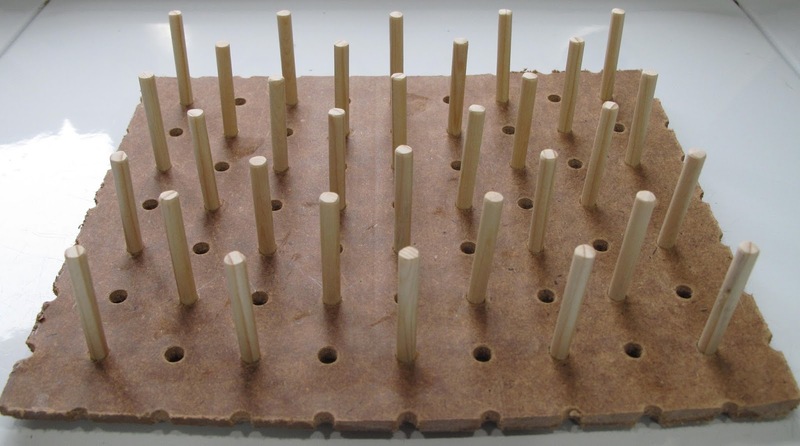 Glue the dowel segments in the holes of the pegboard. My dowels fit very snug so there was no need to clamp or support them while the glue dried. 4. Spray paint the pegboard/dowels – three coats of paint were needed to fully cover the brown color of the pegboard and keep the surface smooth. 5. Once dry, attach the frame. 6. Mount to the wall and load the thread. 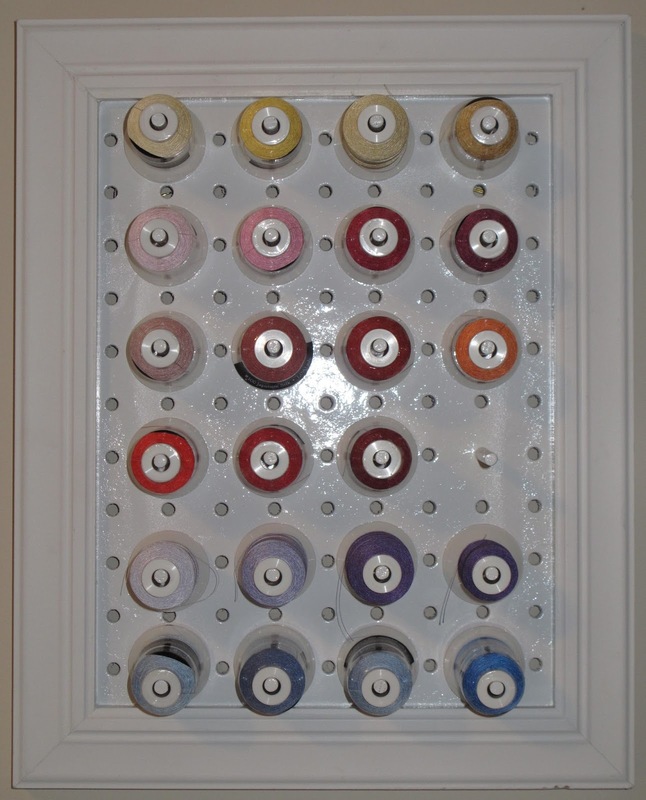 My three thread racks, loaded with spools/mini-cones, work great and add a pop of color to my sewing room walls! About a two years ago, I moved my long arm sewing machine into the smallest bedroom in our house. When setting up the room, I decided I wanted to stencil a phrase of encouragement on the wall. Looking on-line, I found that the custom stencil I was thinking about (“Dream it… Plan it… Do it!) would be expensive. Instead of ordering one, I thought I should check out options for a personal cutting machine to make my own stencil. While more expensive, I realized that if I purchased the cutter, I could use it for a lot of other ideas. So, I purchased a Silhouette Cameo cutting machine, made my own stencil, and it turned out great. Since then, I have used my Cameo for a few other projects – personalized cards, applique templates, and recently glass etching stencils. One of the things I never really thought I would try to cut with the Cameo was fabric – I just didn’t think that the blades would not be able to cut smoothly. She found was that fabric alone did not cut well, but when stabilized with Totally Stable and freezer paper the outcome was acceptable (but not perfect) and the fabric retained original feel after the stabilizer was peeled off. Fabric stabilized with fusible web cut cleanly, with the heavier the fusible web the cleaner the cut. Since I like to use Misty Fuse when doing applique so that there isn’t a lot of extra bulk, I really don’t want to use a heavy stabilizer when cutting out applique pieces. So, I decided to do my own experiment. I liked the freezer paper idea, but thought I would try to enhance that approach to make the fabric stiffer for a cleaner cut. I thought that if I heavily starched the fabric prior to stabilizing on freezer paper, I may get a better result that must freezer paper alone. I used my own starch spray recipe, to have control over the stiffness created. This recipe makes a fairly stiff starch spray (for normally pressing when I am quilting, I omit the Sta-Flo from the recipe). The starch in the Potato Vodka gives a very nice, soft feel to the fabric while pressing very smooth. After starching, I fused freezer paper to the back of the fabric, attached it to the sticky cutting mat and loaded it into the Cameo cutter. The cut file that I had created included some basic shapes with straight lines and curved lines. 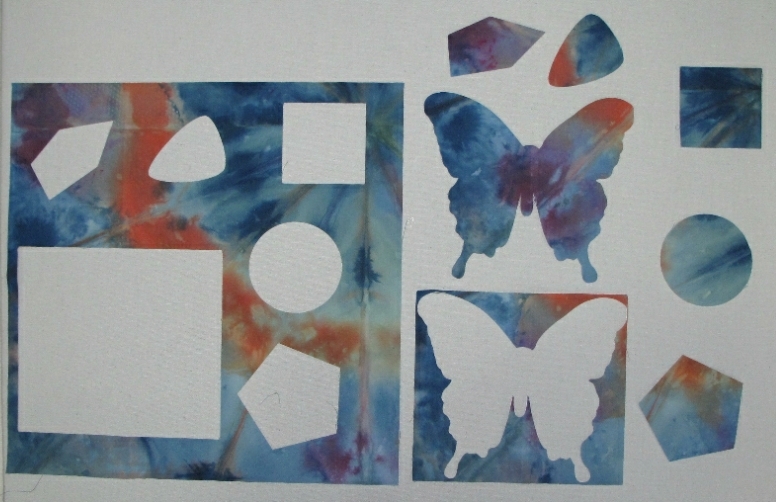 I also included an intricate butterfly to see how well the details could be cut. The Cameo cut the basic shapes really well. But, the details of the butterfly were less than impressive. The blade tended to pull the fabric when moving. 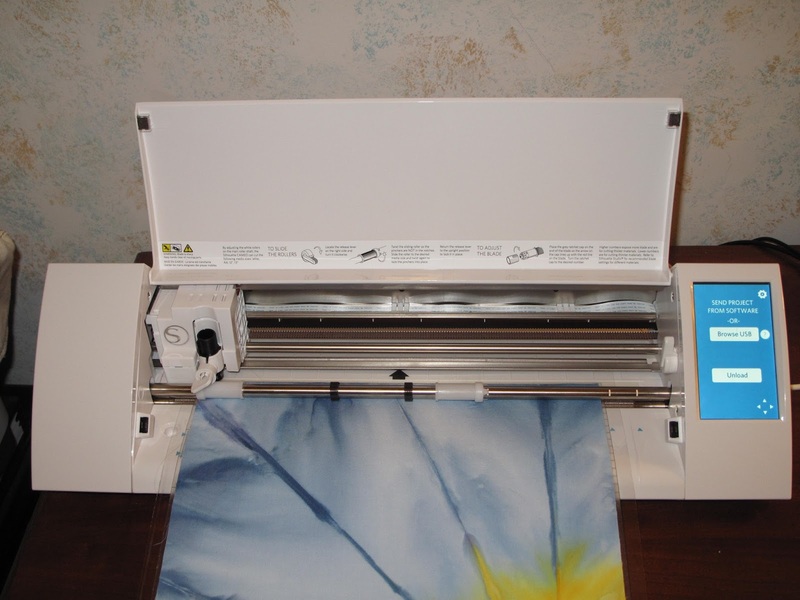 So, I thought – what if I load the Cameo with the fabric “sandwiched” between the cutting mat and the freezer paper? Would this keep the blade from pulling on the fabric? After starching and fusing to freezer paper, the fabric was and loaded it into the Cameo cutter with the freezer paper facing upward. This configuration meant that the fabric was sandwiched between the sticky cutting mat and the freezer paper. 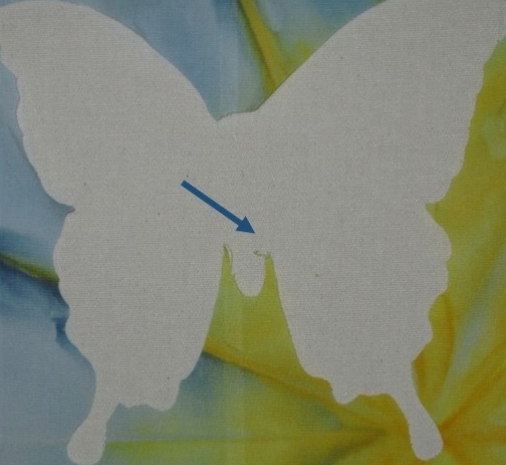 I was amazed to watch the Cameo cut the basic shapes and the details of the butterfly with great precision!